Before we get to this week’s eye-candy, let me show you this thing I found in one of the shop windows in Dubai. Of course, with the cooler weather, all the woolly things are coming out, and this one garment on display caught my eye. Can you see it? 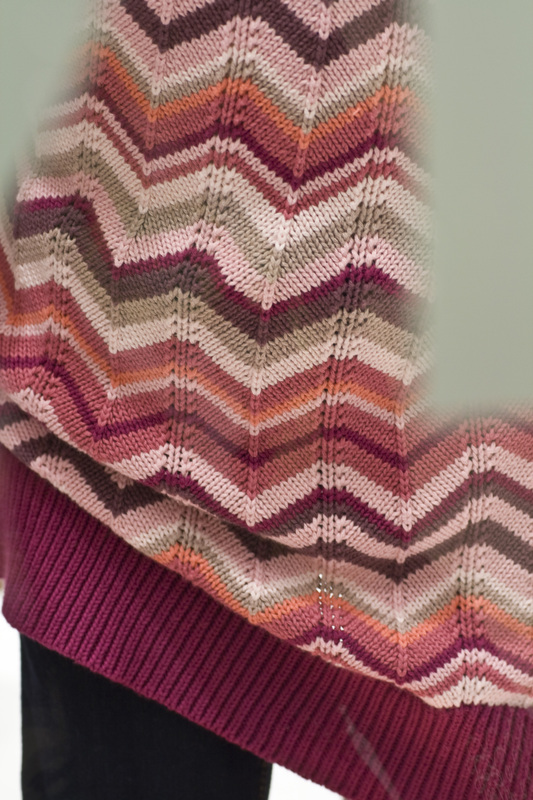 It’s the Jaywalker pattern on a pullover! Yeah. I’m nerdy like that. It’s just, you know, my Ravelry life crashing with my real life. Not that there’s anything wrong with that, but I am still amazed when it happens. Okay, you came here for the yarn. First edition of Eye-candy Friday 2011 – wohoo! Here is one of my latest additions, which thankfully arrived in Dec 2010 instead of Jan 2011 so that it doesn’t count against my Stashdown 2011 yardage in. It came from the lovely island of Greece, from Susan. Two skeins of Sundara Sock Yarn in the fiery colourway One Foot Forward. When we did our swap last year, I misunderstood what we discussed and apparently sent Susan more yarn than we agreed on. So when she realized this she said she would send me more yarn to make us even. And now we are! 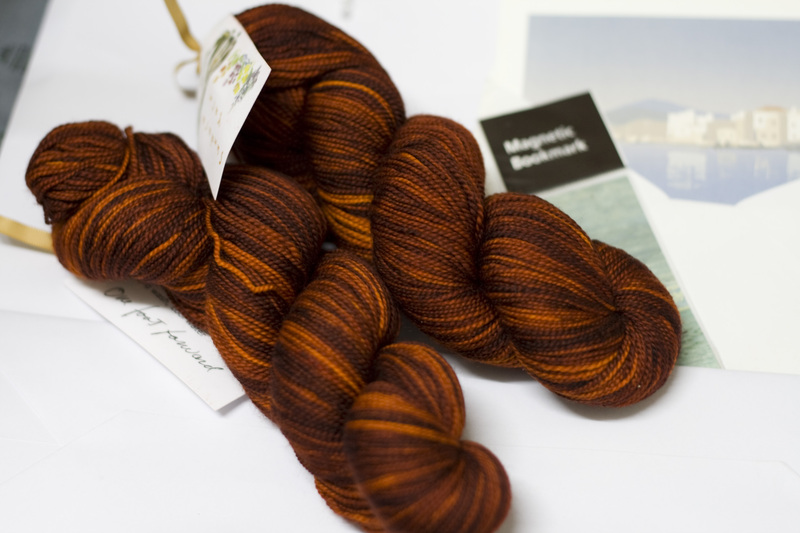 We’re even talking about doing a mini-KAL on the Daybreak shawl. I want to use these skeins and find a suitable contrasting colour. Susan made a couple of suggestion after looking at my stash so now I just need to take the yarns out, put them side by side and see if they would work for me. Thanks again, Susan! Ooh Sundara from Greece! Can’t wait to see what color you pair this with for your Daybreak. 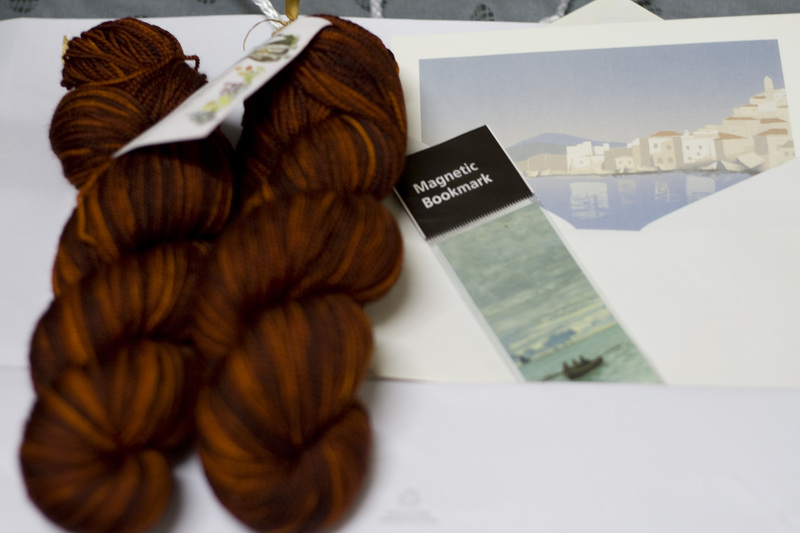 I swear that yarn was redder when it left Greece. Errrrmmmm I’ve started on the Daybreak, but am already taking a break from it, because I’m doing a test knit, so when you’re ready to get going, I can jump straight back in! Show us picks of the main contenders Jocelyn. ← Finally! Comic Con lands in the UAE!